‘Flagstaff House’ is one of our projects under construction in Flagstaff, Arizona. There are very intricate custom design details in the home with collaboration and a life long collection of Jason Scott, producer of the Jason Scott Collection (jasonscottcollection.com). Pictured below are two custom designed walls that will be integrated into the interior of ‘Flagstaff House’ created by Jason Scott. 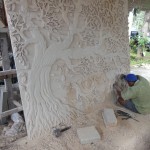 The stone wall has been constructed and carved in a small village on the island of Java, Indonesia. 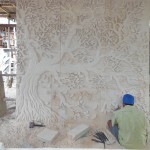 The detail and craftsmanship of the stone wall are amazing, as well as labor intensive. 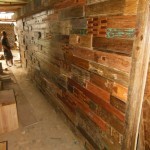 The teak wood wall shown below is a detail Jason constructed that will act to separate the public and private spaces of the house. 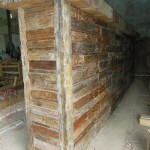 The wall is constructed of scape teak wood, capped with rusted metal. The detail in the assembly of the wall adds immensely to the overall look of the wall, with each scape wood piece placed systematically. 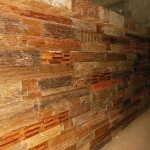 The texture and warmth of the teak wall is outstanding. This home features more small details through out, representing Jason’s life long journey and passion of craftsmanship. We are happy to have been apart of these process from the very beginning and are enjoying the construction process with Jason!